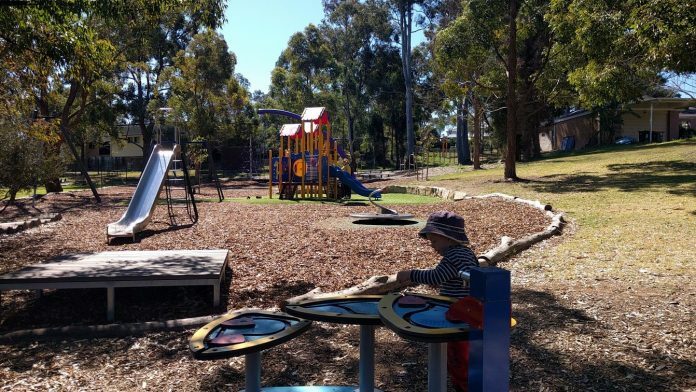 Here are our top 20 spring playgrounds and parks to visit in and around the City of Parramatta. There is a mixture of parks that are gorgeous in spring and playgrounds that are great at this time of year. Most have a little shade for a warmer spring day. 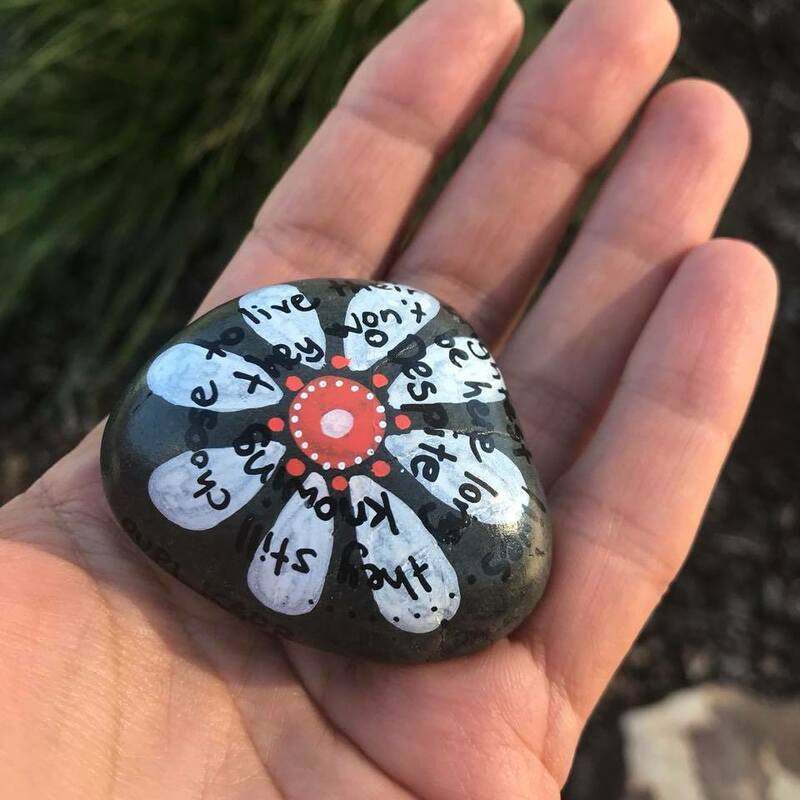 While you are out exploring these 20 top spring playgrounds and parks, keep an eye out for some hidden painted rocks! Note: For people with asthma and allergies, spring may worsen your symptoms with higher levels of pollen in the air. If this affects you or your family, best to check the daily pollen count before heading outside. The gorgeous historical Wistaria Gardens are the closest thing the City of Parramatta has to a garden park. 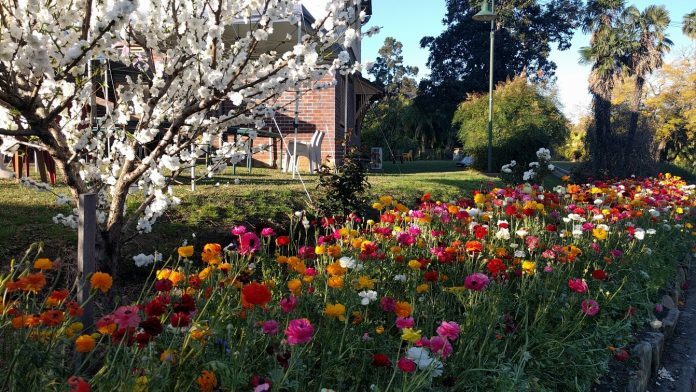 Located on the grounds of Cumberland Hospital, near Parramatta Park, the gardens are best visited in September. Sadly though they are currently in limbo while they transfer from Western Sydney Health to Parramatta Park Trust. And VERY disappointingly, the spring planting has not taken place this year. 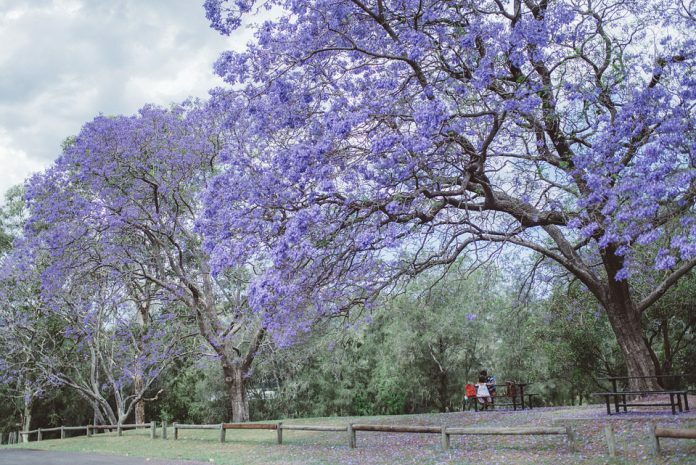 We are urging the City of Parramatta Council to help save Wistaria Gardens this year for the community to enjoy. It would be wonderful if Council could plant some spring flowers and organise a community open day. In the meantime, there are still some beautiful spring trees to enjoy in the gardens. Playground Summary: there is no playground in the Wistaria Gardens. The nearest one is Domain Creek playground in Parramatta Park, about a flat 600m walk away. 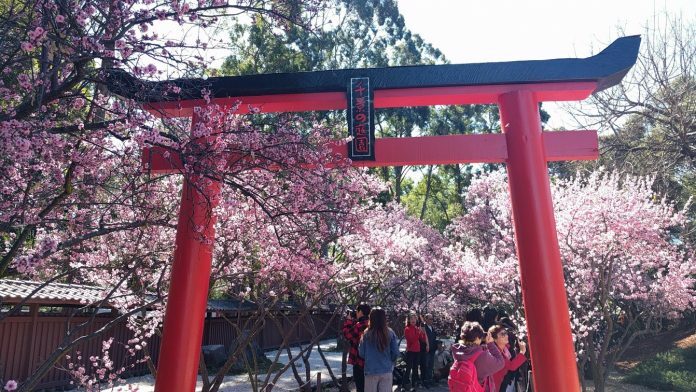 Auburn Botanic Gardens is a must visit for families! It is one of the places we recommend the most and it is particularly gorgeous in spring with the cherry blossoms. There is a lovely native animal enclosure, beautiful peacocks, two playgrounds, bbqs and plenty of gorgeous gardens to explore, plus free entry during the week. 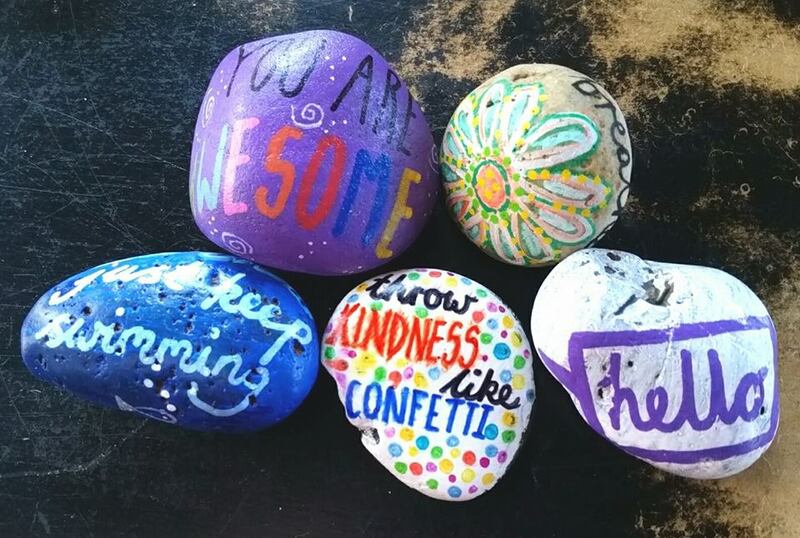 On weekends, the entry fee is $5 for adults not residing in the Cumberland Council area. Playground Summary: best suited for kids 1-8yrs, medium sized, open, swings, climbing play gym with slides, maze, liberty swing, some natural shade, toilets nearby. 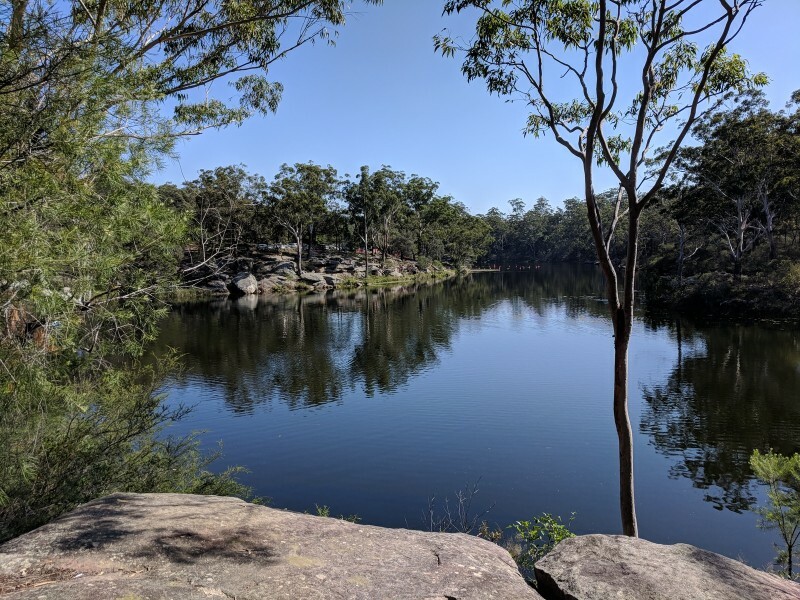 Nurragingy Reserve is a gorgeous place to visit, not far west of Parramatta. It has a water waterfall, Chinese gardens, three playgrounds, water playground, large duck pond, bush trails, on-site parking, bbqs and picnic facilities, path to ride on and a kiosk. Playground Summary: best suited for kids 2-10yrs, open, sand and woodchip grounds, water playground (operates 10am to 3.30pm in spring). This fantastic regional park is a local favourite and a gorgeous spot to walk, ride and play. Throughout the park, there are bbqs and picnic shelters, grassed areas, ducks and paths to ride on. It is particularly lovely to explore during mid-late spring, with the rose garden and jacaranda’s. Parramatta Park also boasts two playgrounds. 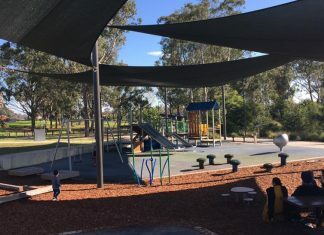 Domain Creek playground is the newer and larger one near the Queens Road Gatehouse. Pavilion Flat playground is on the opposite side of the park, near the George Street Gatehouse and the new Grounds Keeper Cafe, and will be upgraded by June 2019. Playground Summary: Best suited to kids 2yrs+, large, sandpit with diggers, flying fox, nature based play, walking see saw, musical instruments, in-ground trampolines, elephant slide, water pumps. Parramatta River Foreshore Reserve is a very picturesque spot along the river, in between Riverside Theatres and Parramatta Ferry Wharf. You can literally take a walk through the history of Parramatta, via the pavement art. 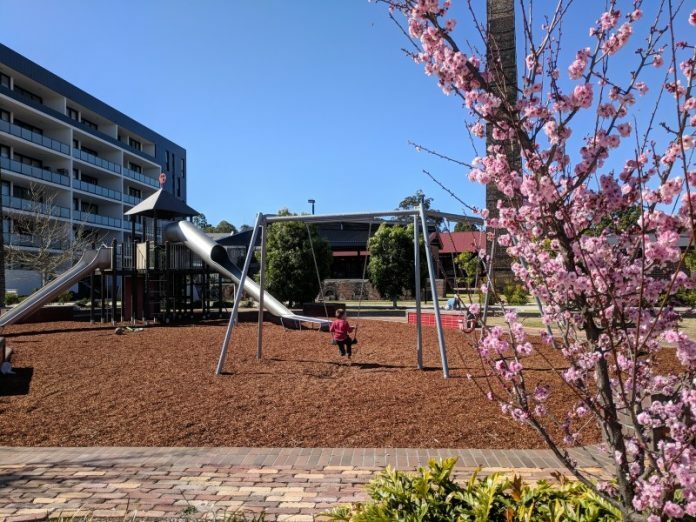 There is a great adventure playground for kids as well as cafes nearby (including Bay Vista Dessert Bar), path to ride on, toilets a short walk away and the water fountain bridge (Barry Wilde Bridge). 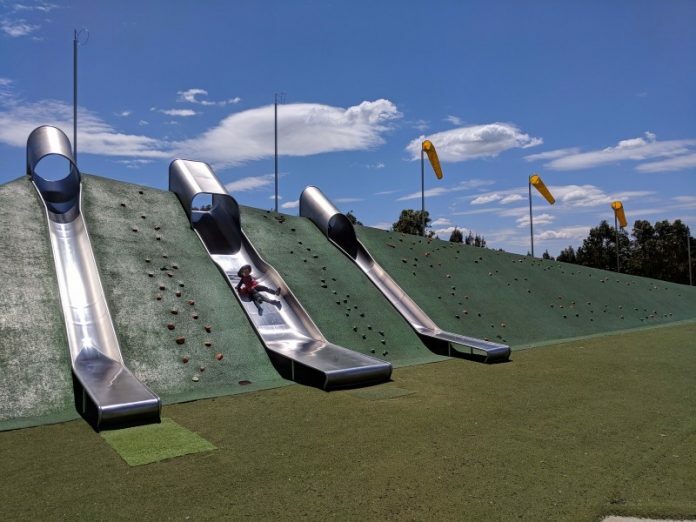 Playground Summary: Best suited to kids 4-12yrs, medium size, open, softfall ground, some natural shade, giant slide, sandpit, water pump, rock climbing. 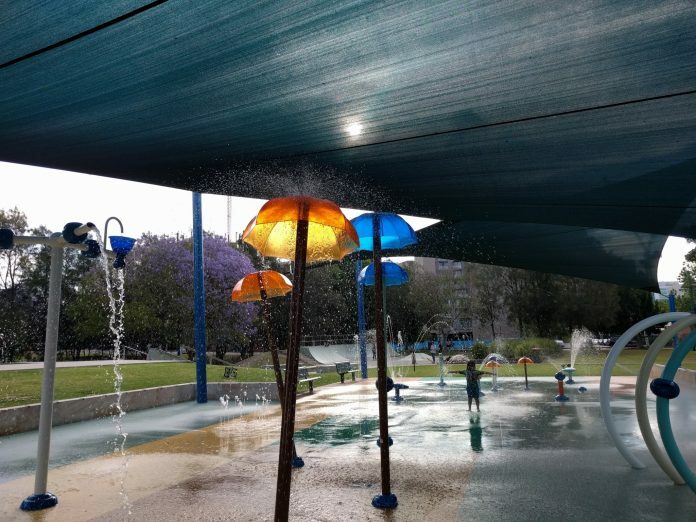 James Ruse Reserve is a perfect spot on those hot spring days, where the kids (and you) can cool off under the water fountains. bbqs, climbing rope tower, skate park, trees to climb, bbqs, picnic tables, metered street parking. Playground Summary: best suited to kids 2-10yrs, medium to large size, water playground with shade cloths, climbing rope tower, swings, slides, rockers, skate park. 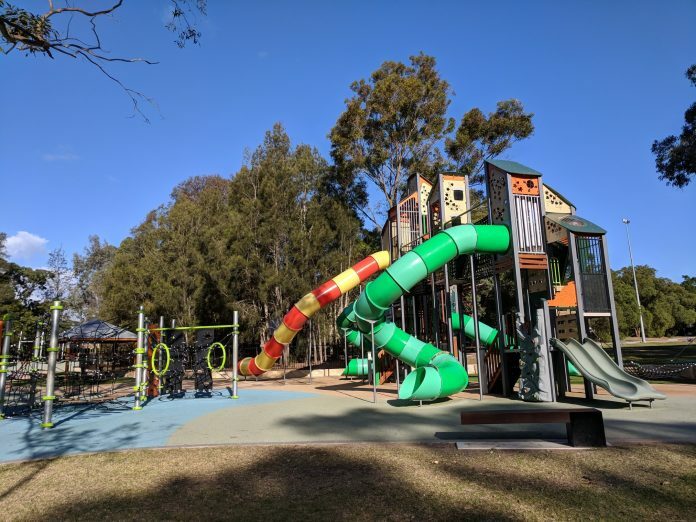 Strathfield Park ticks almost every box when it comes to a great, large playground for hours and hours of fun, year round and for kids of a range of ages and abilities! And it is definitely our favourite playground at the moment. Playground Summary: best suited 2-12yrs, open, large size, softfall ground, scooter/ bike track, four big slides, toilets, picnic shelters, bbqs, street parking. By far the largest and most popular playground in the City of Parramatta. And gorgeously located along the Parramatta River, within Sydney Olympic Park. 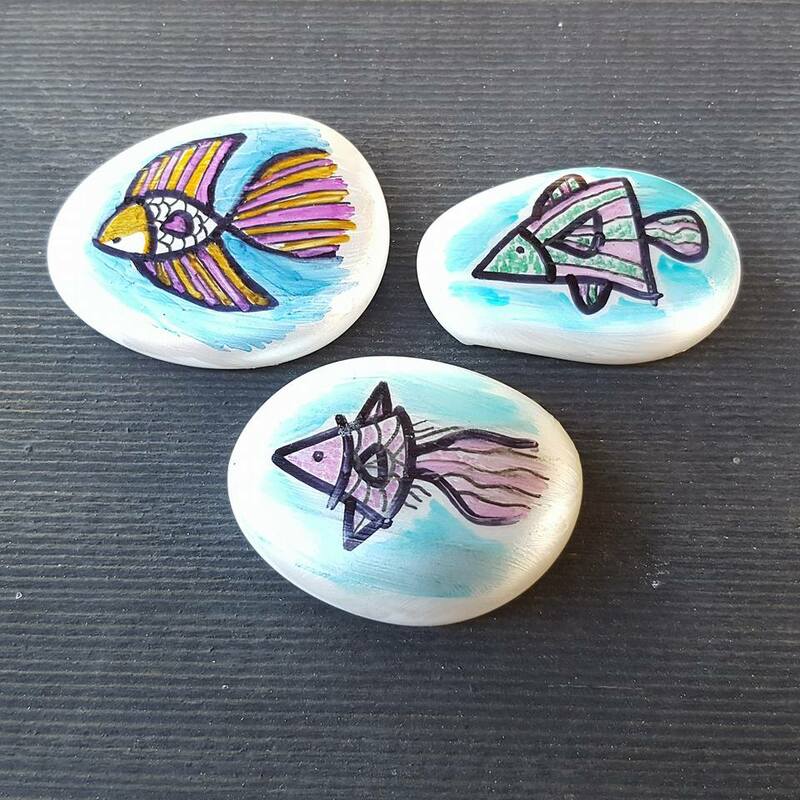 It’s fantastic for kids 4 years+. Halvorsen Park has a fantastic nautical themed playground along Parramatta River, complete with its own submarine. This is the home of the monthly Market By The River and a lovely spot to ride along and enjoy the river. Thankfully toilets will finally be built here in 2018/19. But there are bbqs. Playground Summary: best suited to kids 2-8yrs, medium size, submarine, sandstone boat, boating rope, shade cloths, rope climbing towers, swings, nature based play elements. Right in our backyard is this gorgeous little waterfall. And what is even better is that the walk to it is very kid friendly! Keep in mind that it is best to visit Balaka Falls in Hunts Creek after some rain as otherwise there is only a little trickle of water to see. There is a small playground with a swing and slide on Lesley Ave, near one of the entry/ exit points. Playground Summary: There are two playgrounds in the Hunts Creek Reserve, where you can start your walk to Balaka Falls from. The new playground on Lesley Ave is an easy 500m walk away. And the Northam Drive playground is about 700m walk away with two creek crossings. Calling all kings and queens, knights and princesses….your castle awaits! The recently upgraded playground at Sherwin Park looks like it stepped out of a Robin Hood storybook. Within the park there is also a path to ride on, toilets, picnic tables, little garden, grassed area, basketball court and a tree lined path that will be full of blossoms at the beginning of spring. And just around the corner is The Container Cafe. Playground Summary: best suited to kids 2-7yrs, medium size, open, gravel ground, castle, slide, swings, rope bridge. 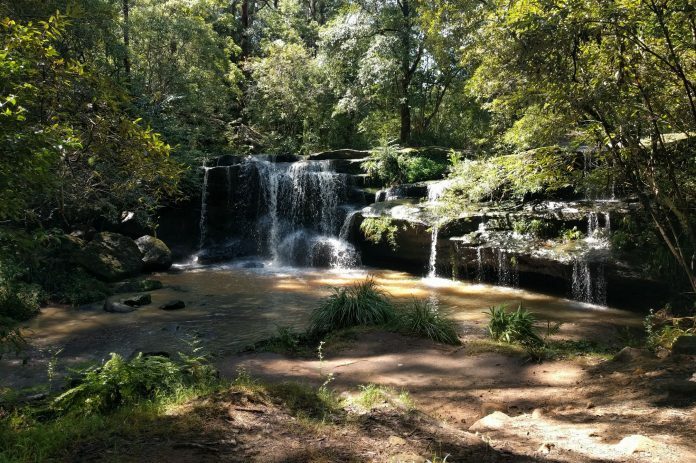 There is so much to do at this natural oasis just north of Parramatta. From kid friendly bushwalks around the lake and playing in the playground to swimming, paddle boats and bbqs! Lake Parramatta Reserve also has ducks, toilets, cafe, picnic shelters and on-site parking. Lifeguards are typically on duty at Lake Parramatta from late October to late March / early April on weekends and during school holidays. Playground Summary: Best suited to kids 1.5-7yrs, small to medium size, partially fenced, some natural shade, swings, climbing play gym with slide, monkey bars, liberty swing. 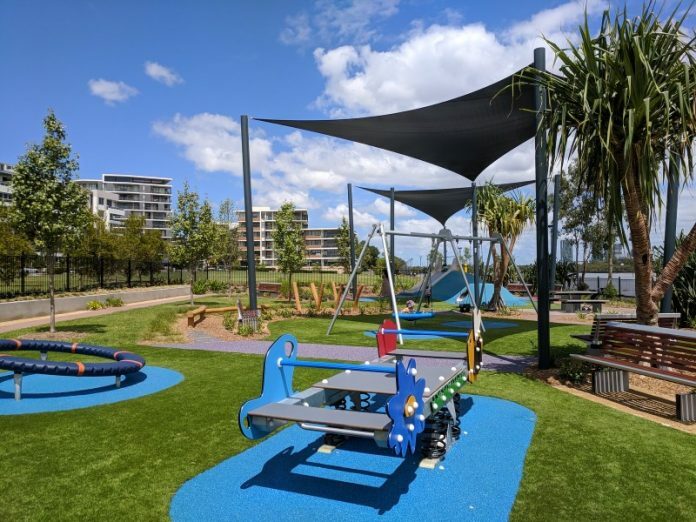 Water views, fence, shade sails, synthetic grass and coffee nearby……this newish playground overlooking Homebush Bay is great for parents of little ones. Playground Summary: small to medium playground, best suited for 1-5yrs, fenced, softfall and synthetic grass ground, scooter/ bike track, water pump and table, open grassed area, some shade from sails, toilets, cafe nearby, water play nearby at The Connection, street parking, accessible by train or bus. You will find colourful equipment set amongst the bush at Northmead Reserve playground, at the back of the sports fields. There is also a path to ride on and open grassed area, all within a quiet bush setting. Playground Summary: best suited to kids 1-7yrs, medium size, open, set back from the road, natural shade, flying fox, water maze table, low level equipment for bubs and toddlers, birds nest swing. 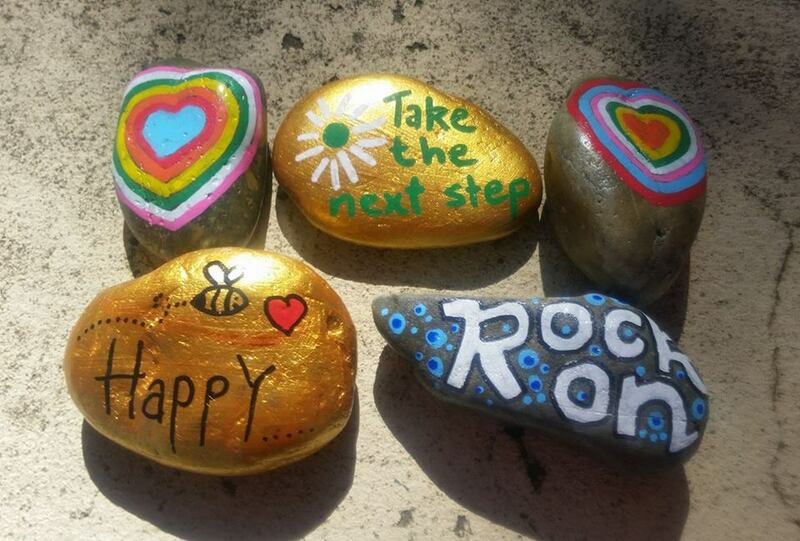 Hughes Park is a fabulous community space just off Burns Bay Road in Lane Cove. There is a brightly coloured, fantastic playground great for a range of ages, toilets, BBQs, picnic shelters, community centre, exercise equipment, community vegetable garden. Playground Summary: best suited to kids 1-10yrs, medium to large size, open, softfall, swings, train, merry-go-round, see saw, slides, partially shaded, climbing walls. 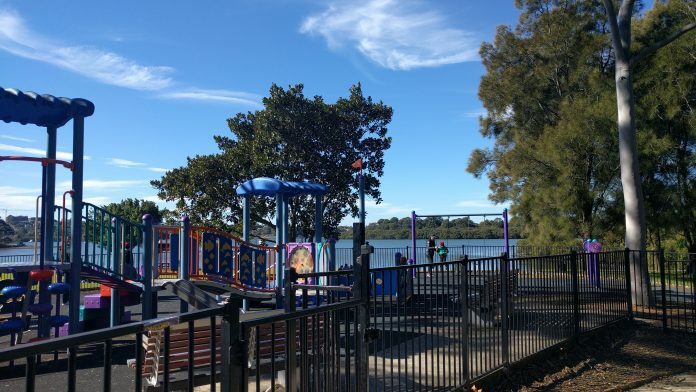 Positioned in a lovely spot along Parramatta River, with a three good playgrounds, McIlwaine Park and Brays Bay Reserve make for a great family outing. There is a fenced toddler playground and next door a playground for older kids. Then there is the Kokoda Trail Memorial Walkway, Kokoda Cafe and another playground. Playground Summary: best suits for kids 1.5-10yrs, medium size, open and fenced, shade cloths over one playground and some natural shade for the other two, sand pit, climbing play gym, slide, handheld merry-go-round, rope climbing tower, boat. 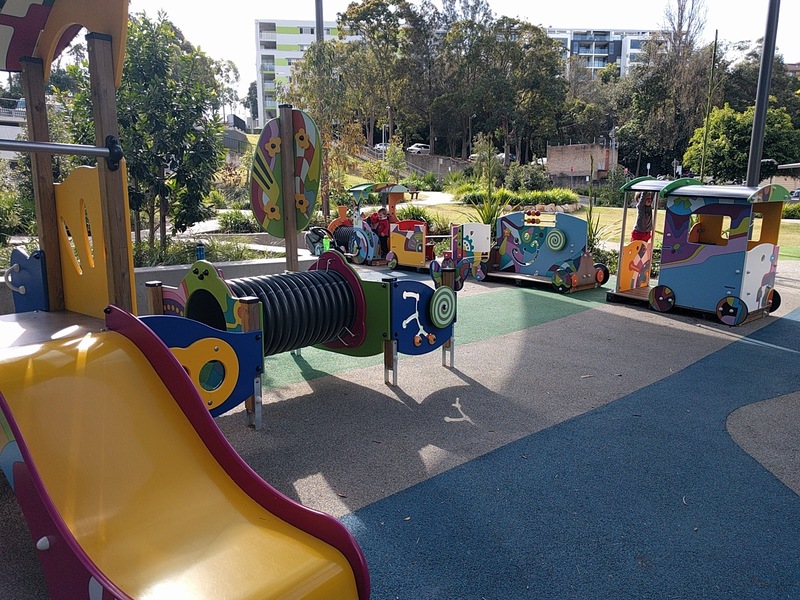 Lytton Street Park is a lovely park that covers almost the entire way from Wentworthville Mall to the Wentworthville train station. 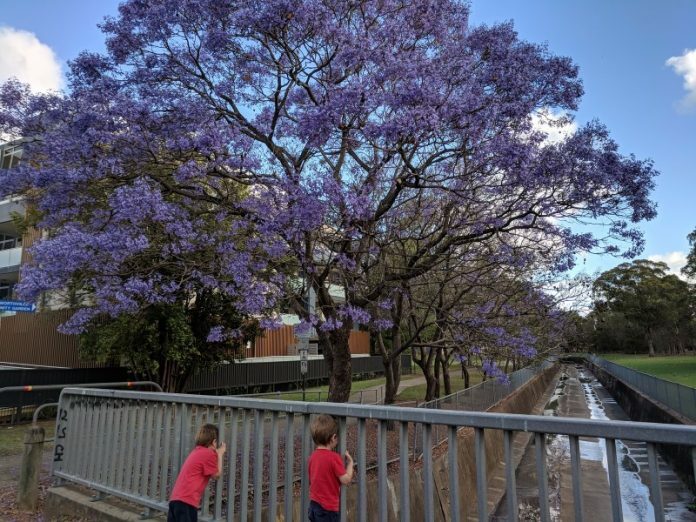 It runs along a flood way lined with jacaranda trees that bloom in October-November. There are playgrounds, picnic tables, BBQs, and walking paths. Plus, it’s home to the Wentworthville Community Garden, which has it’s annual open day on 20th October 2018. Playground Summary: best suited for 2-10yrs, open, bark ground, medium to large size, good natural shade and a range of play equipment spread across three areas. Before there was the castle at Sherwin Park, Reynolds Park was known as the castle park. 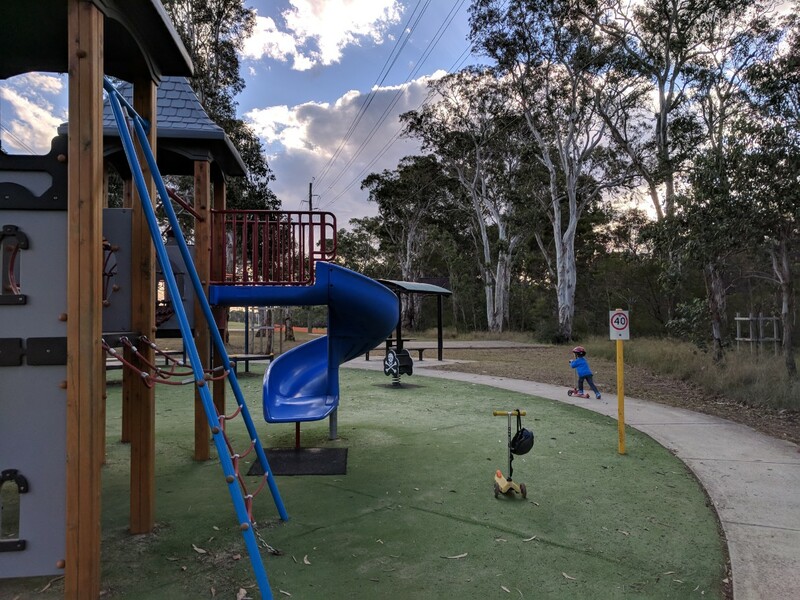 Aside from the castle playground, there is a purpose built scooter/ bike track, bbqs, picnic shelters, bushwalks and a path to ride on. Unfortunately there are no toilets at the moment but there are plans to put an amenities block here. Playground Summary: best suited for 2-8yrs, open, synthetic grass ground, medium size, castle play gym, slides, swings, monkey bars, suspension bridge. 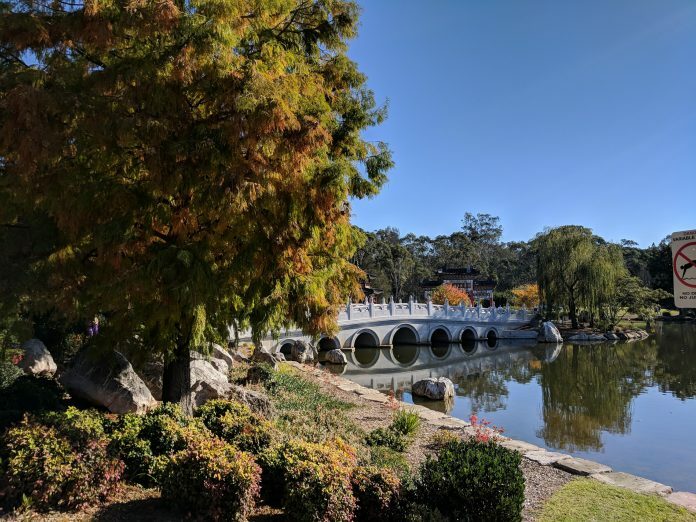 Banjo Paterson Park is definitely a hidden gem and a gorgeous spot along Parramatta River. The park got a new themed adventure playground towards the end of 2016 and there are bbqs and picnic tables nearby. The park also has lovely picnic spots along the river, toilets, walking trails and lots of on-site parking. Playground Summary: best suited to kids 2-8yrs, medium size, open, partially shaded with some natural shade and shade cloths, bark ground, swings, tower with slides, climbing play gym, see saw, rope climbing. 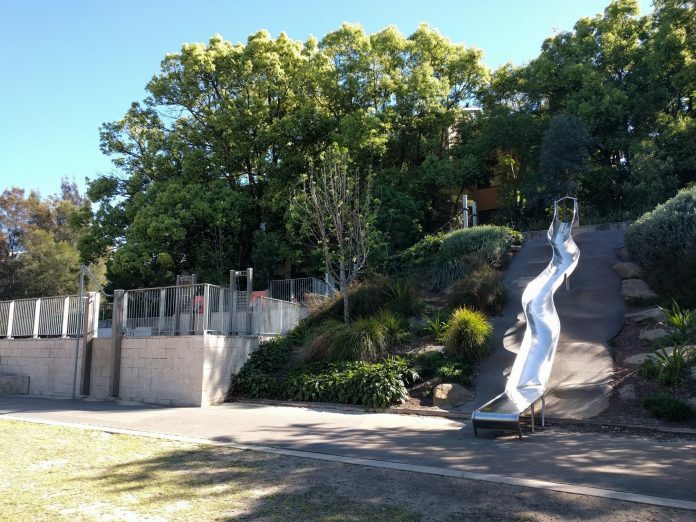 The smokestacks near the old Channel Seven site on the Eastwood/ Carlingford boundary are signposts for a hidden gem of a park, with a big slide, bbqs and lovely grounds to explore. Plus it is seeped in history of the old brickworks that once operated here. Playground Summary: best suited to kids 4-10yrs, small to medium size, open, partially shaded by the smoke stack shadow at certain times of the day, bark ground, swings, tower with slides.